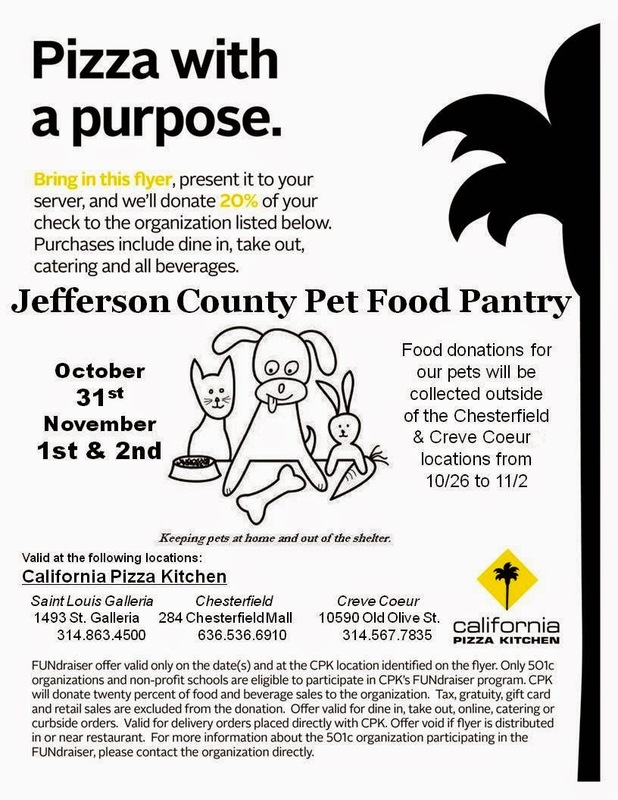 Jefferson County Pet Food Pantry : California Pizza Kitchen Fundraiser 10/26 thru 11/2!! California Pizza Kitchen Fundraiser 10/26 thru 11/2!! Starting this Sunday 10/16 through Sunday 11/2, California Pizza Kitchen (Creve Coeur and Chesterfield Mall locations) will be collecting pet food for Jefferson County Pet Food Pantry and 10/31 through 11/2 bring in this coupon (just print it out) to the Chesterfield Mall, Creve Coeur or Galleria locations and we will receive 20% of your check!